Hampton Inn & Suites by Hilton and Homewood Suites Denver Downtown Convention Center welcomes fans of a galaxy far, far away to buy their tickets today for the Denver Art Museum’s Star Wars® costume exhibit this upcoming fall. Tickets went on sale today for guests to purchase online or by calling (720) 913-0130. The exhibit opens to the public beginning Sunday, November 13th, 2016 through Thursday, April 2nd, 2017. The exhibit focuses on the creative process behind the movies, encompassing the heart of George Lucas’ vision and the exciting challenge of interpreting his legendary characters into reality. Hampton Inn & Suites by Hilton and Homewood Suites Denver Downtown Convention Center welcomes fans to book their rooms in Denver now for this exciting opportunity and make a weekend of this awesome exhibit. For more information and to purchase tickets, please visit http://denverartmuseum.org/exhibitions/starwars?gclid=CIGUwd79wMwCFdcYgQod94wPWg. At Hampton Inn & Suites, each guest room welcomes travelers with great amenities including free Wi-Fi throughout the hotel, complimentary daily breakfast buffet, 24-hour fitness center and business center, premium in-room movie channels and much more. The hotel offers guests a choice between king and queen rooms as well as accessible rooms, based upon availability. Located ½ mile from the Denver Art Museum, Hampton Inn & Suites Denver Downtown is within easy walking distance to various Denver attractions. 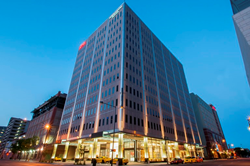 For more information or to make reservations for the Hampton Inn & Suites Denver Downtown Convention Center, guests may call (303) 534-7800 or visit http://www.hamptoninndenver.com. At Homewood Suites, all guests check in to comfortable suites with plenty of room. Each suite includes a kitchenette, complete with a full-size refrigerator, microwave, dishwasher, stove and utensils. Suites also feature a welcoming dining area, inviting king-size bed and much more. High-speed Wi-Fi and breakfast are complimentary. Mountain View and accessible rooms are available upon request, based on availability. This hotel offers a Welcome Home™ reception, Monday through Thursday nights, with complimentary small plates and alcohol; guests must be of legal drinking age. For more information or to make reservations for the Homewood Suites Denver Downtown Convention Center, guests may call (303) 534-7800 or visit http://www.thedenverhomewood.com. Both the Hampton Inn & Suites by Hilton Denver Downtown Convention Center and the Homewood Suites Denver Downtown Convention Center are proudly managed by Stonebridge Companies in Denver, Colo. Founded in 1991 by Navin C. Dimond, Stonebridge Companies is a privately owned, innovative hotel owner, operator and developer headquartered near Denver. This diverse listing of properties includes select-service, extended-stay, mid-scale and full-service hotels in markets throughout the U.S. For detailed information, visit the website at http://www.sbcos.com.